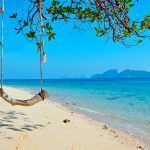 Nam Du island — The ultimate travel guide - Living + Nomads – Travel tips, Guides, News & Information! 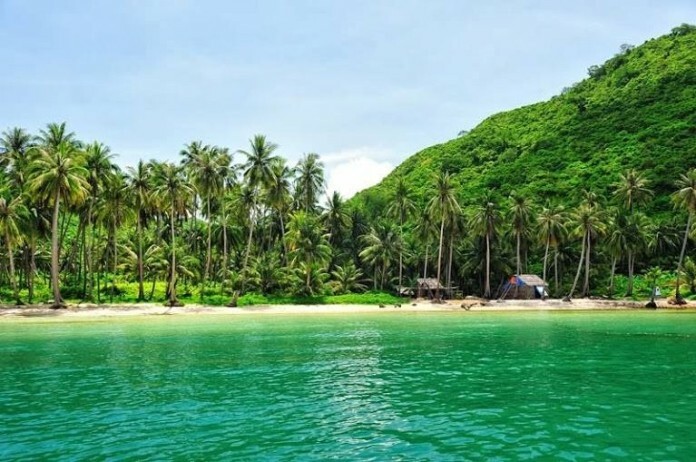 Located 250 km away from Saigon (now Ho Chi Minh City) by road, Nam Du Islands is being considered as a destination that Southern backpackers have to visit in holiday seasons. 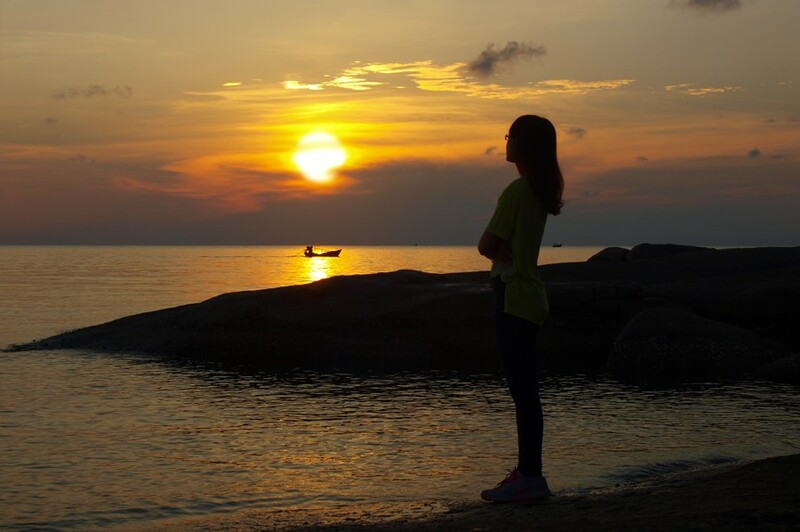 The best time to travel to Nam Du Islands is from December to March the next year when the sea is calm and crystal blue, so who has seasickness will feel more comfortable while travelling on a boat. 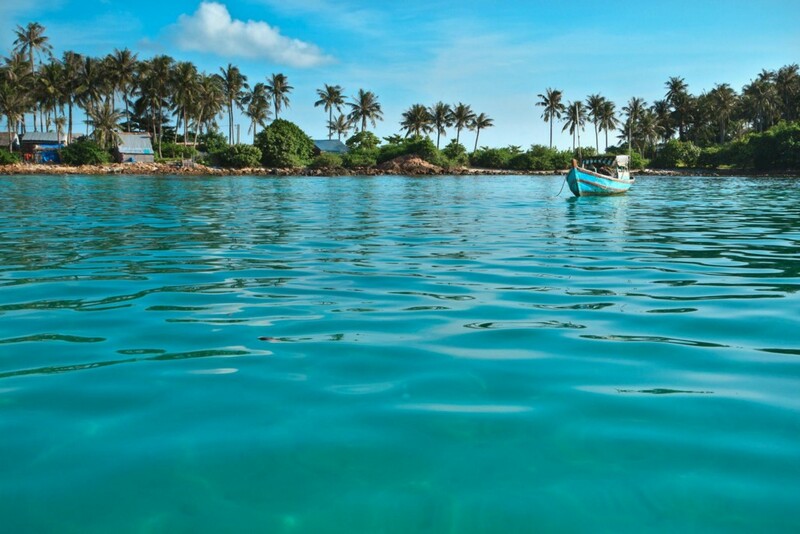 The sea in Kien Giang is not directly affected by storms but the rainfall caused by storms accounts for a quite large proportion, the rainy season here usually starts from April – October every year. 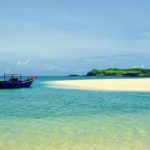 To get to Nam Du archipelago, you need to go to Rach Gia city – Kien Giang. The most convenient means of transportation is the coach from Mien Tay bus station, with the approximate cost of 150,000 – 170,000 VND/ ticket. You should take the coach at 11 PM to get to Rach Gia at 6 AM the next morning. 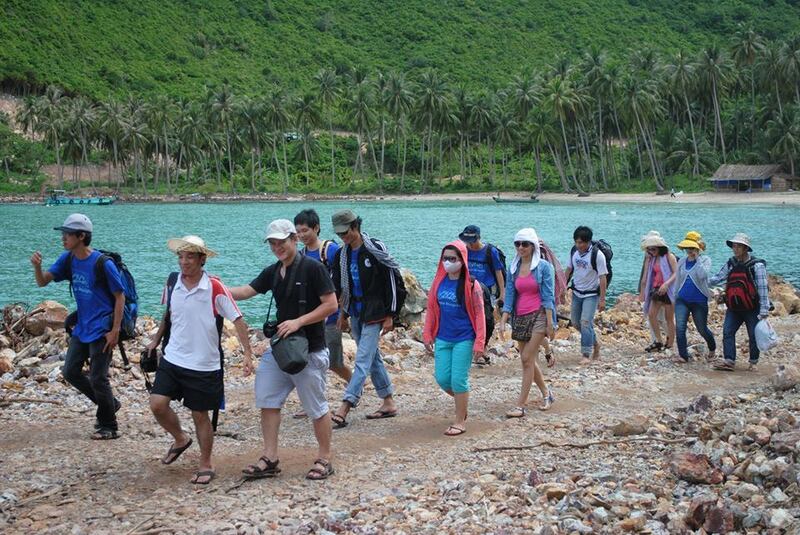 To continue the journey to Nam Du, you use express boat, the round-trip fare is about 440,000 VND per person. If there’s stormy sea level 6 or higher, the express boat service will stop. Some boat agencies to get to Nam Du archipelago from Rach Gia. 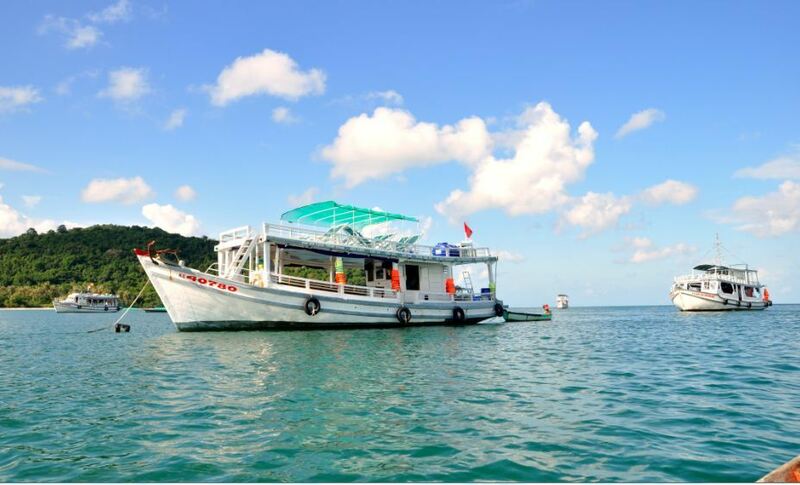 If you take a boat at 8:15 AM, the boat will get to Hon Lon terminal in Nam Du archipelago at approximately 11:00 AM. 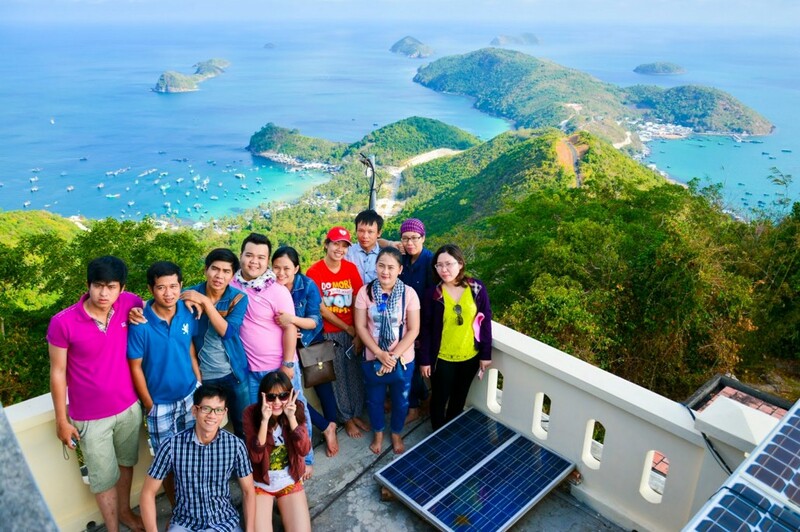 To explore the islands around Hon Lon island and visit some beautiful places, you guys should rent a boat. In the islands, some people have boats for rent (if you aren’t able to find one, you can go straight to the pier, find fishing boats of local people, discussing about price and places you want to go). You can rent motorbikes at boarding houses for about 150,000 – 200,000 VND/ day, and get to your favorite places as much as you like. 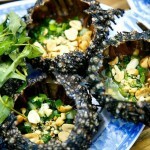 Where to stay in Nam Du? There are 2 ways to stay at night in Nam Du: Boarding house or house of local people with the price of 150,000 – 200,000 VND/ night. If you like to experience more, you can rent a ground and a tent to spend the night. 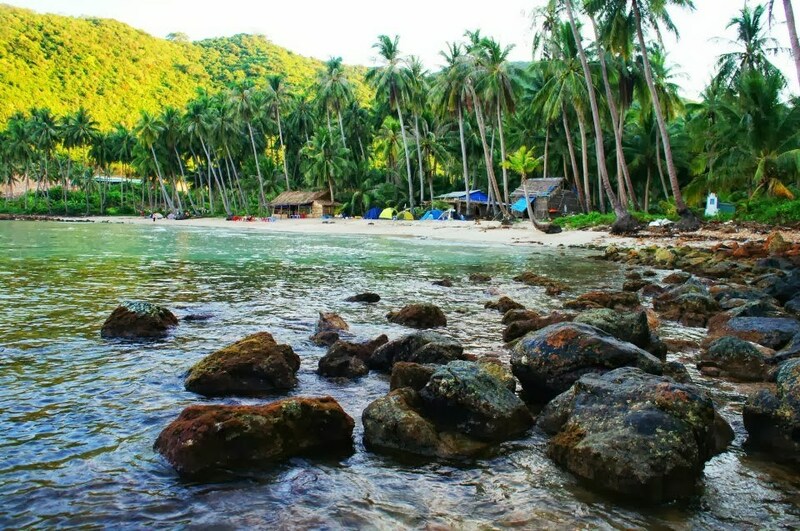 The most suitable grounds for pitching tents are in Hon Dau because here there are coconut trees and a quite large sandy beach, convenient for camping as well as for many activities, the ground rental is about 30,000 VND/ person. Meanwhile, tent rental is 40,000 VND/ person. 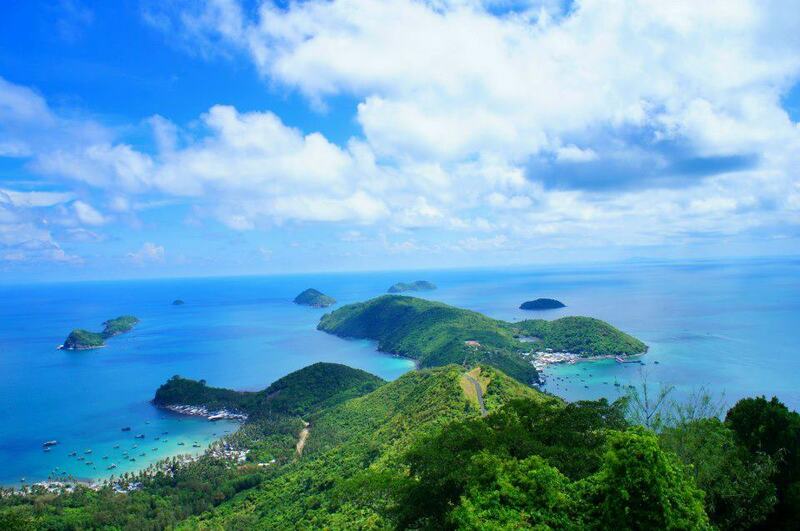 A very beautiful bay with the area in The Gulf of Thailand. 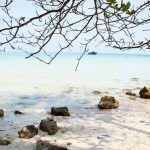 It is considered as the most beautiful beach in Nam Du archipelago. 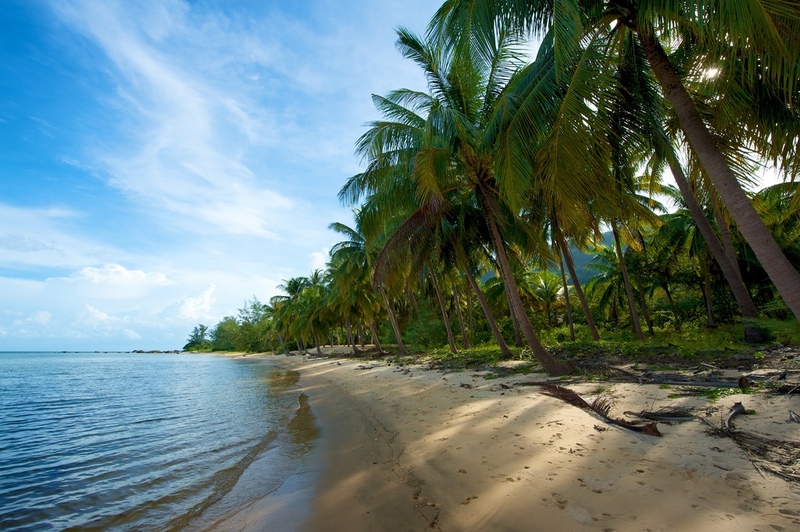 Leaning lustrous green coconut trees create shade, some of them even have tree life up to 70 – 80 years. Here, you can dive to catch squid or fish or to admire the coral reefs. Cay Men beach is pleasantly uncrowded, so you can freely play and swim as much as you want in the clear and cool sea water. Additionally, you can catch the snails in the rocks along the beach. Ngu beach lies in the west of Cu Tron. 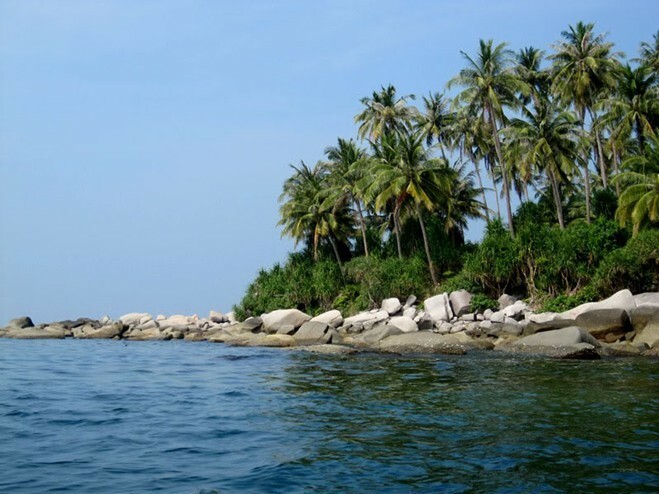 Legend has it that on the way to Siam, King Gia Long stopped here so this area is called Ngu beach (the original name with full diacritics is “Ngự beach”, ‘Ngự’ means an act of stopping to rest or stay at a place). In the dry season, this place is still full of freshwater, while other areas are facing a serious freshwater shortage. Here, there is a well which is always filled with freshwater. Local people assume that the well was dug when the King arrived here so it is called King well. 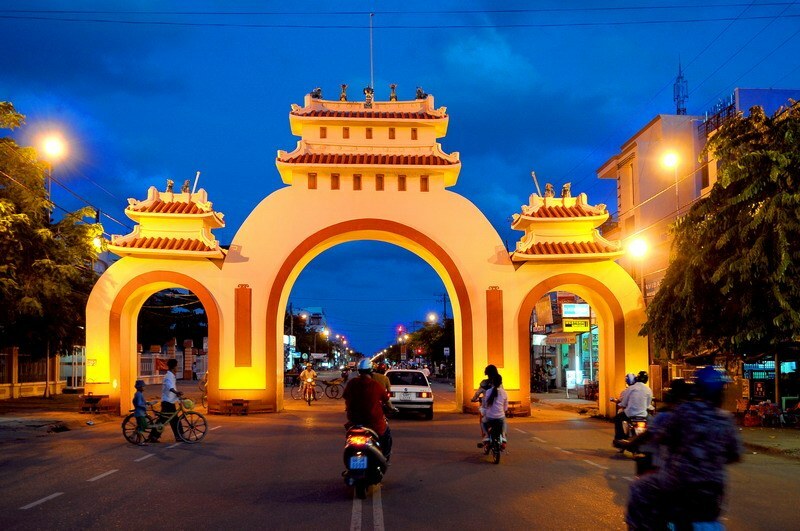 According to folk, in the 16th century, on the way to Phu Quoc for trading, there was a great battle between people from the Netherlands and China. A few days later, there were hundreds of Chinese corpses pulled over on this beach, so people called it Chet beach (with full diacritics: “Chệt Beach”). Nam Du lighthouse sits on top of Hon Lon (Cu Tron) in An Son commune. It is considered to be the highest lighthouse in Vietnam due to its location on top of the hill which is 300 meters higher than sea level. 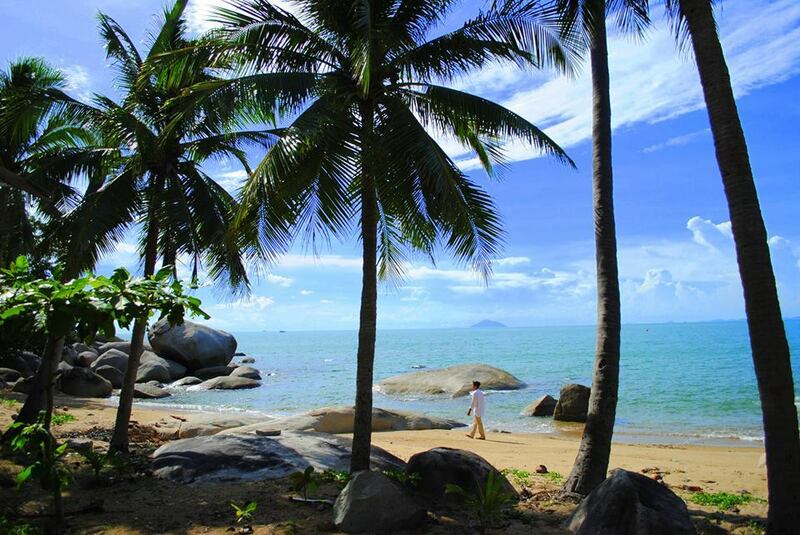 Similar to Hon Lon, the beach here is beautiful with many green coconut trees rustling. 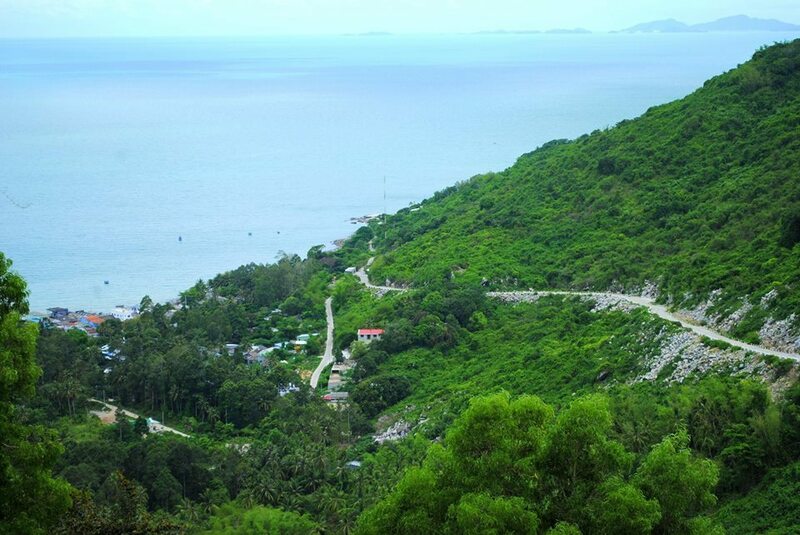 Hon Dau is quite big, compared to other islands, primeval forests occupy for approximately 90% of the area. Near the shore, there are many coral reefs growing, they are not as good as others in deep water but the sea water here is crystal clear and very clean. 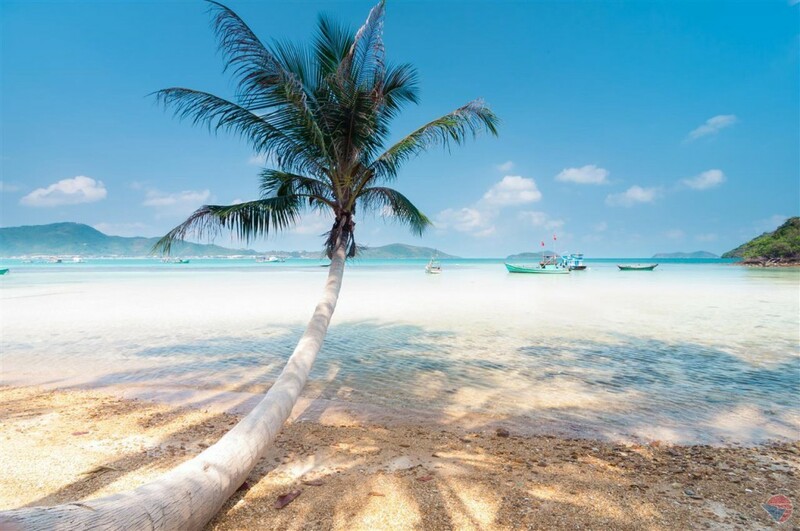 Some coconut trees are sloping towards the sea, you can lay down on their body and take a nap in cool breezes. 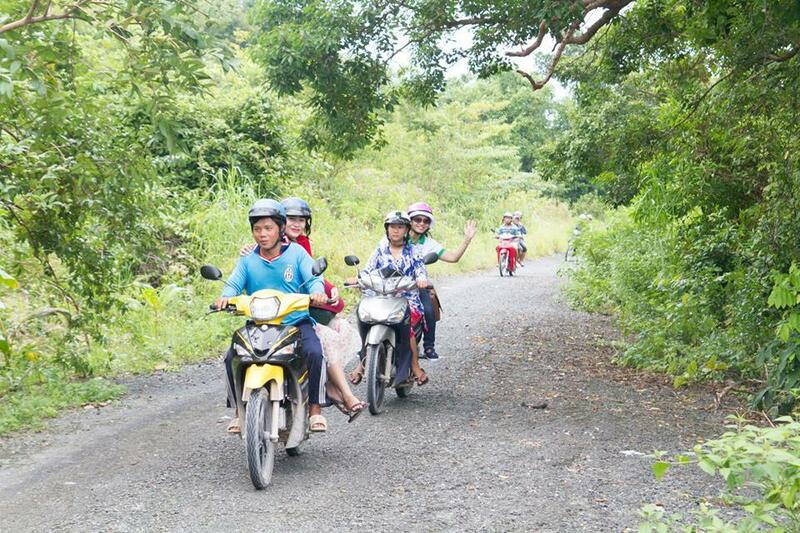 As one of inhabited islands, now there’s only the family of Mr. Duong Van Sau living in Hon Nom. This island is reclaimed and built by Mr. Vuong Van Kieu (father of Mr. Sau) in year 1960. The whole island has an area of about 10 ha but only 3 ha is arable, the remaining area is completely rocky. Hon Mau is about 200 ha wide with more than 120 adjacent households traversing the lowest part of the island. Most people here have life and job connected closely with the sea. The island is small so once you set foot here, local people from the elderly to children easily know that you come from other places. 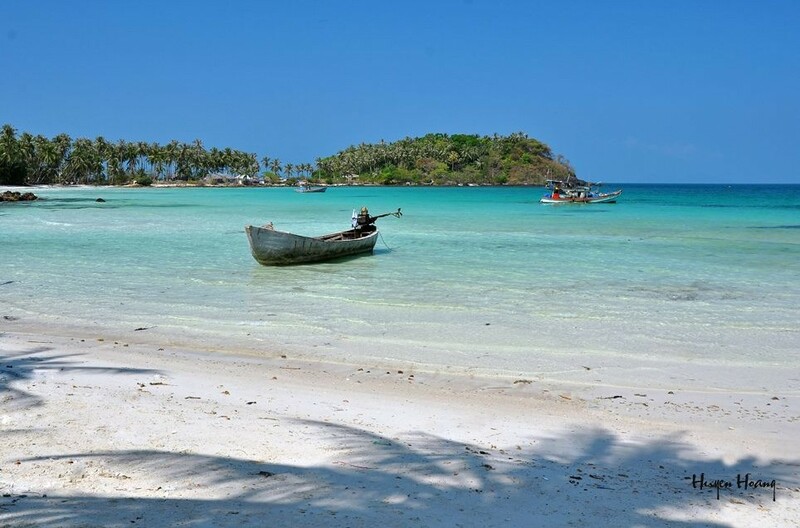 Of 21 islands of the archipelago, Mother Nature seems biased when giving this small island wonderful beaches. There are five beaches in the island. 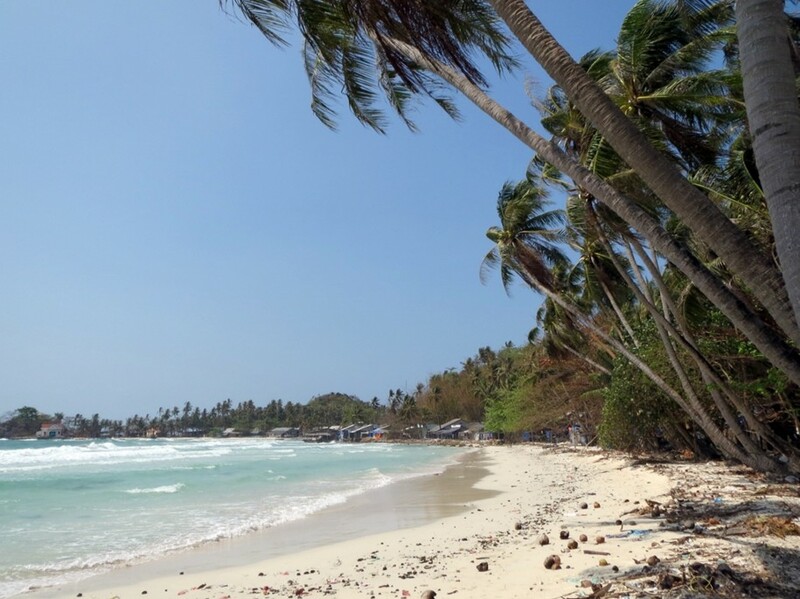 Among them, there are two rare white sandy beaches: Chuong Beach and Nam Beach, the rest are three rocky beaches: Bac Beach, Da Den Beach and Da Trang Beach. 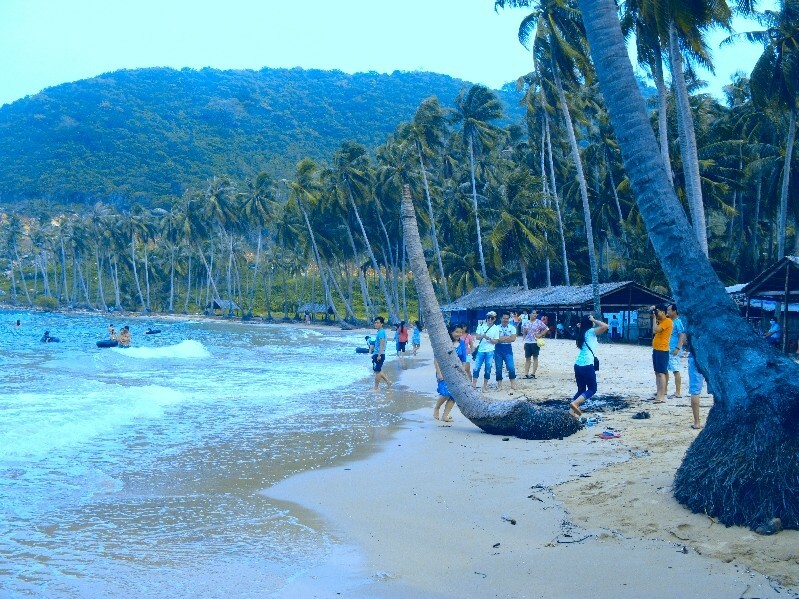 Nam beach is the island’s facade. This beach is almost quiet all year round, so all boats, ships for trading stop here. Therefore, population has increased. However, this beach is also very clean with white soft sand. 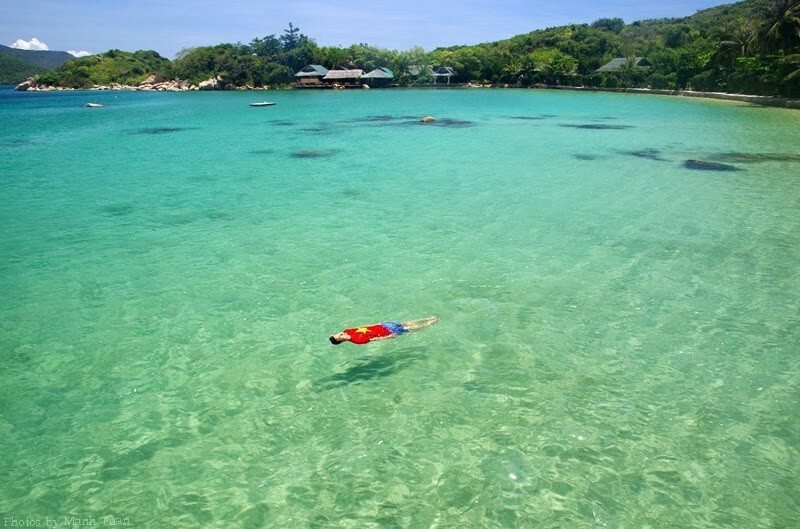 The most interesting thing is to immerse in cool water on Chuong beach. This beach seems like a bay and looks like a giant lake surrounded with coconut trees with tree life longer than human age. The sandy beach stretches, sea water is blue and so clear that you still can see the bottom when having been meters away from the seashore. Besides are two perfect stone beaches. Da Den beach has many beautiful type of stones. 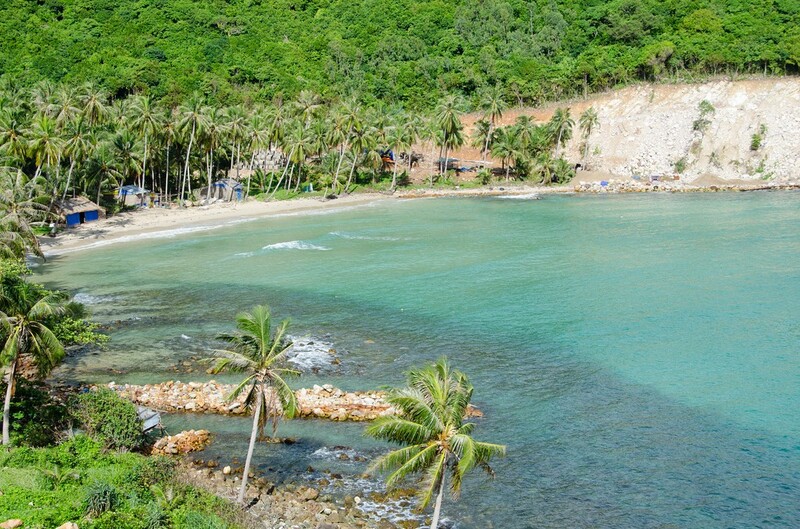 The most are glossy black stone so local people take it as the name for the beach (Da Den Beach with full diacritics is “Đá Đen Beach”, ‘Đá Đen’ when being translated to English is Black Stone). The stones on this beach have a lot of shapes, colors. When sunshine pours down, the stones in the sea become sparkling with many eye-catching colors. There are some with very strange pattern. They are zigzagging blue, red like marbles. From Da Den beach, walk for about 15 minutes to get to Da Trang beach. The whole beach has only one color white from the stones. The stones with the size from your finger to hand lies along the beach. This beach almost doesn’t have sand, just only white stones. Whoever comes to those two stone beaches always brings two stones back as a gift from the sea. Hon Ngang has a pier with calmest waves in Nam Du so it attracts many ships, boats and fish cages. Getting to Hon Ngang from Hon Lon takes 30 minutes by ferry, there are two ferries with departure time at 7:00 AM and 3:00 PM daily. Hon Ngang is Nam Du commune center. Hon Ngang pier has thousands of ships, boats and nearly 60 fish cages anchored not in any order. 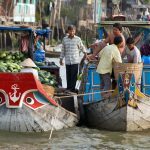 The shore is a row of adjacent stilt houses raised on concrete and bamboo piles stretching 2 km. There’s only a small road with a width of about 1.5 m, without any kind of public transportation. It is a place tourists often choose to get together for camping and to pitch tents to stay the night. This is also a quite appropriate location for snorkel, catching urchin, fishing, swimming. 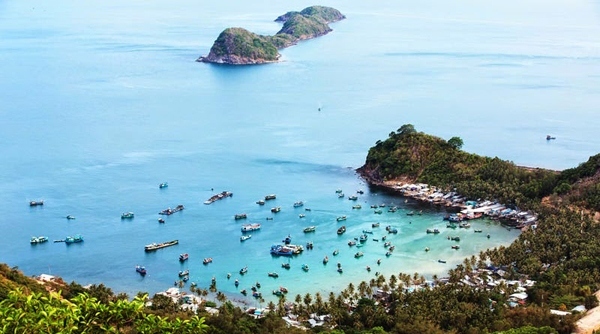 Located between Hon Tre and Nam Du archipelago, 60 km away from mainland, on the color deep blue of ocean, Hon Son (Hon Son Rai) appears as a giant mountain. 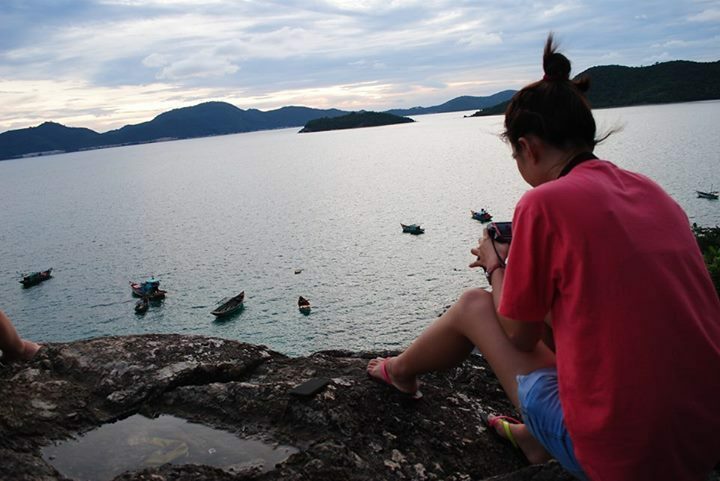 Since 1983, this charming island is named Lai Son, is one of four islands in Kien Hai commune (Kien Giang) with the area of 11.5 km2 and more than 2,000 households. 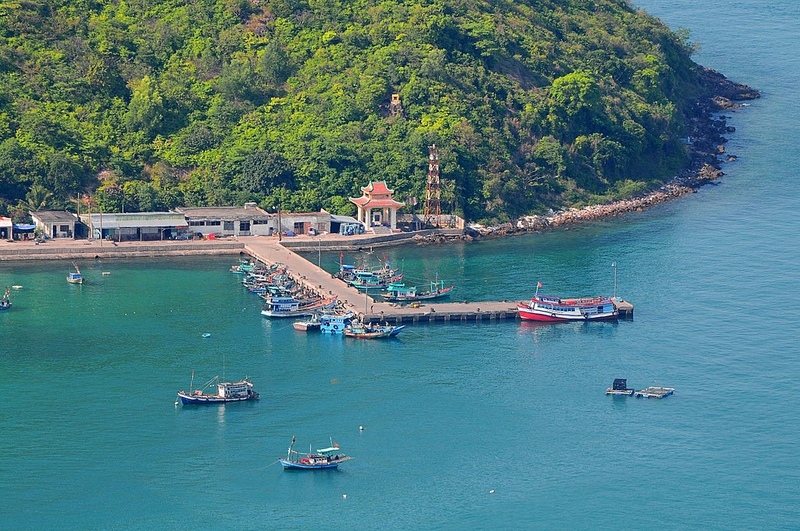 Coming to Hon Son, visitors can admire the dreamlike scenery, the harmony between sea – island with the humanistic values associated with the history, culture of a place surrounded with rolling waves. On clear days, from afar, Hon Son looks like a sparkling jewel with 7 peaks among the waves. The closer you get, the more attractive this island becomes with the green color of palm trees cover and with the romantic, peaceful scenery. 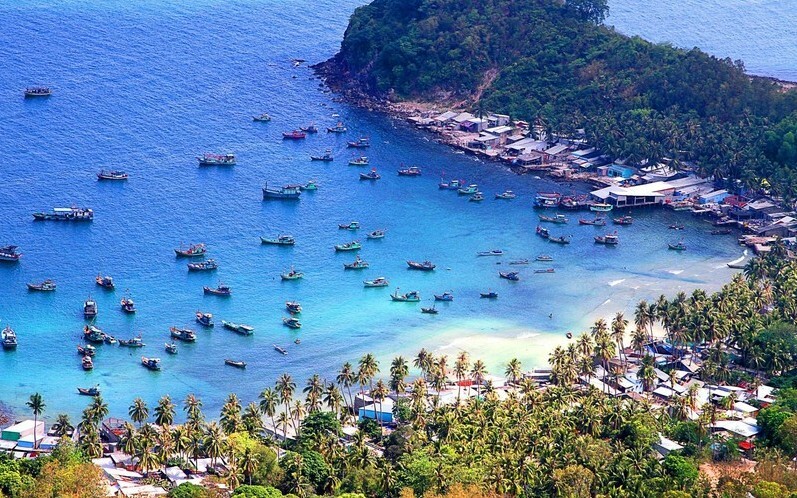 Along the coast, there are fishing villages, crowded boats with an extremely lively atmosphere. Standing on the shore and having a view of the scenery, everyone is enthralled by the small, big stones stacked on top of each other with interesting appearances. Especially at Thien Tue beach, near Nam Hai temple, there are imposing rocks with many shapes arising over the pebble stones, bringing strange feeling. Most visitors when coming to Hon Son like to explore Ma Thien Lanh hill, which still keeps many myths that every person here knows. They are the stories of fairies descending on earth on top of the hill which is called the yard of fairies afterwards. Later on, this place has plenty of trees, caves so many hermits come here. On the way to Ma Thien Lanh, there’s still an open-air statue of the Buddha and lots of traces recorded on rocks by ancient people. Needlefish, also called Blue Bone fish, is a sea fish with long body, pointed beak like halfbreaks. A big one can be a meter in length and about 2-3 kg in weight. It is also called Blue Bone fish because fish skin is blue and when looking at it, the bones seem to be blue too. People choose the freshest fishes from the sea, clean and clear their body slimes, put them between the banana stems tightly, wind and tie carefully. 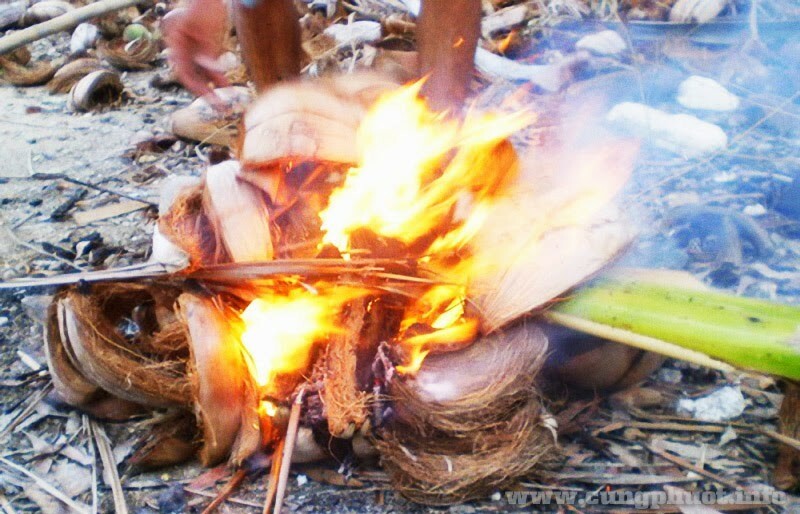 Then heap the firewood to grill the fishes, when the stems wilt and dry, the fishes are cooked. When eating, you split the stems, fish skin cracks and exposes meat with delicious aromatic smell and flavor which easily satisfies any gourmets from mainland. The fish meat it not only sweet but also a bit tough, wrapped and rolled with rice paper, served along with wild vegetables such as creek premna (la cach), lolot pepper (la lop), ming aralia (dinh lang), blumea (cai troi), brindle berry new leaves (dot bua)…; creating a special color that you can’t find anywhere else for the archipelago. 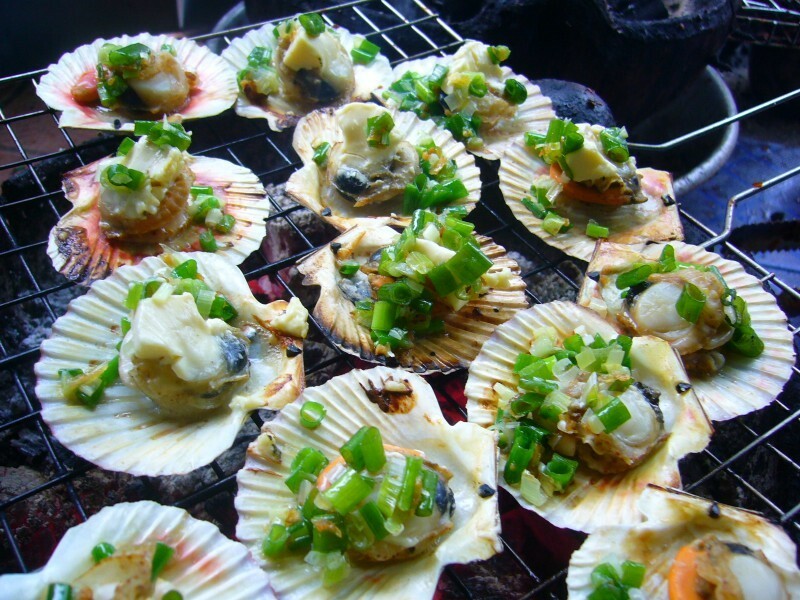 Scallop is a familiar seafood with the delicious ivory flesh suitable for both stir-frying and roasting and is one of food materials to be processed into many tasty and nutritious dishes like: roasted scallop with pepper and salt, grilled scallop with spring onions and peanuts, steamed scallop with Mien threads. Squids are caught during the breeding season so they have many eggs, the number of squids having eggs accounts for above 70%. According to experts, squid having eggs is very nutritious food. 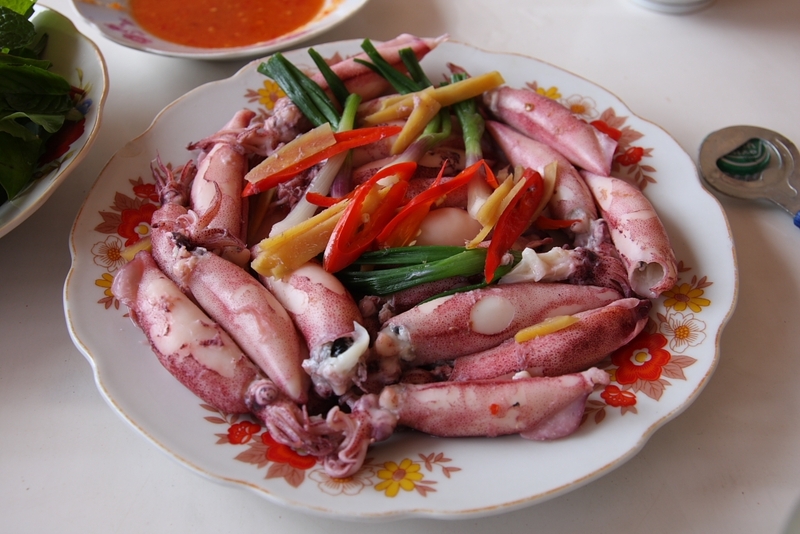 Squid is easy to be processed into many delicious dishes so it’s very popular. Squids having eggs can be made into dishes: fried squid with pepper, with pineapple sauce, with butter, grilled squid with chili sauce or sauté recipe… but the most famous one is still steamed squid with ginger because the sweetness of squid isn’t lost, squid is easy to be processed and the taste doesn’t become boring. 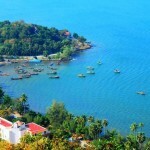 The west coast of Kien Giang is famous for cobia fish farming small cages. This type of fish has an elongated fusiform black body, looks quite like snakehead. Sour soup with cobia in this place is not like one in mainland. Here, it is cooked with fresh or salted tamarind, chopped lemongrass, ground turmeric. 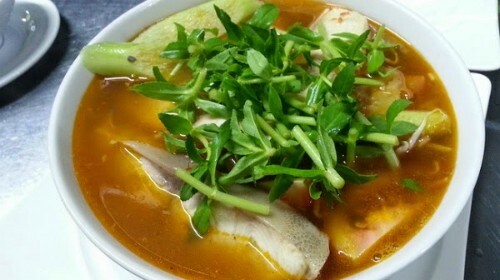 To make the dish more appealing, local people add fresh or sour bamboo shoots. Drying is the oldest method to keep the foods of mankind. Dried fish can be kept for year without decaying. The way of drying fish is simple but effective, fishermen usually apply it to keep the fish if they are not sold. Dried fish has an advantage of being easier to transport than fresh one. 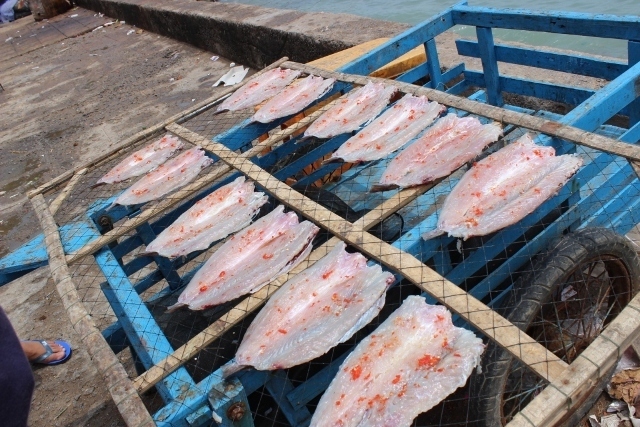 In Nam Du, all types of dried fish are made from fresh delicious fish and are an interesting specialty with tourists. See more Nam Du Islands travel guide at here.